Leo K. Heyl was born in Jeromesville Ohio in 1912. Leo was a graduate of the Wooster High School in 1930 and a graduate of the Cincinnati College of Mortuary Science in 1932. 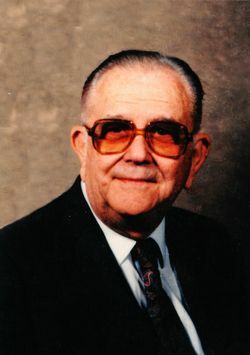 Leo was a licensed funeral director and embalmer. He took leave from his funeral home business to serve as a flight instructor for the U.S. Army Air Corps during World War II and returned to Ashland and his business in 1947. In 1987 Leo was honored by the Ohio Funeral Directors Association for providing Fifty years of professional funeral service to the Ashland community. Leo retired in 1974 however, he never lost sight of the goals of his profession and would visit the funeral home and staff daily to "check in" right up until a few weeks before his death in 2002. Today we still cherish the rich history of professional family service that Leo left for us. We also hold in high regard his goal to make our funeral home hold true to a home like atmosphere that you can feel comfortable in.